Je nach Rolle können Sie verschiedene Arten von Gruppen anlegen. Offene Mitgliedschaft: Jede/r Nutzer/in der Site kann durch Aufruf der Gruppenseite und Anklicken des Beitreten-Buttons Mitglied werden. Mitgliedschaft beantragen: Jede/r Nutzer/in kann die Mitgliedschaft in Ihrer Gruppe beantragen. Als Gruppeneigner können Sie diese akzeptieren oder zurückweisen. Die beantragende Person wird über Ihre Entscheidung automatisch informiert. Mitarbeiter und Administratoren können Gruppen mit kontrollierter Mitgliedschaft anlegen. Sie können Nutzer/innen direkt zu Ihrer Gruppe hinzufügen. Die Mitglieder können sich nicht aus der Gruppe austragen. Sie können der Gruppe Tutor/innen zuordnen. Diese können Feedback geben für eingereichte Ansichten, aber keine Gruppenmitglieder verwalten. Gruppenmitglieder können Portfolioansichten oder Sammlungen zum Feedback bzw. zur Bewertung einreichen. Diese Ansichten sind für Veränderungen geblockt bis sie wieder durch einen Gruppentutor oder Gruppenadministrator freigegeben werden. Der Site-Administrator kann das Anlegen von Gruppen begrenzen auf Nutzer mit Mitarbeiter- und/oder Adminstrator-Rechten. Wenn Sie keine Gruppe anlegen können, haben Sie vermutlich keine ausreichenden Berechtigungen hierfür. Nehmen Sie mit dem Site-Administrator Kontakt auf, z.B. mit dem Kontakt-Formular. If you are allowed to create a group, you see the Create group button on the „My groups“ overview page. Name der Gruppe: geben Sie einen Namen für Ihre Gruppe ein. Pflichtfeld. Der Name der Gruppe muß nicht einmalig sein. Andere Gruppen können den gleichen Namen haben. Um die Gruppe eindeutig zu unterscheiden ist die Beschreibung sehr hilfreich. Associate with institution: The group is automatically associated with the institution in which the person creating the group is a member. If the person is in multiple institutions or a site administrator, they can select in which institution they want to create the group. Gruppenbeschreibung: Kurzbeschreibung wozu die Gruppe angelegt wird. Open: Switch this option to „Yes“ if you want to create an open membership group. This allows users to join the group without approval from group administrators. Request: Set this option to „Yes“ if you wish to create a request membership group. Users will have to send a membership request that requires group administrator approval. Open and request membership groups are mutually exclusive. Friend invitations: Switch to „Yes“ if you want to allow group members to invite friends to join the group. Regardless of this setting, group administrators can always send invitations to anyone. If the friends accept, they will be added automatically to the group. Recommendations: Set this option to „Yes“ if you want to allow group members to send their friends a recommendation for joining this group from a button on the group homepage. If a request membership group has been recommended and the friends are interested in it, they would still need the approval of the group administrator to join. Friend invitations and recommendations are mutually exclusive options. Publicly viewable group: Set this option to „Yes“ if everybody shall have access to content of this group. You only see this setting if the site administrator allowed you to have it. Anybody online can see the group homepage and the discussion forum(s). Depending on the membership visibility, they may also see group members. Only members of the group can see the group’s pages, unless they have been made public, and the files area. Participation report: Switch this option to „Yes“ if you as group administrator want to view a report displaying all group pages and those that have been shared with the group and see who commented on them. Start date: As group administrator you can decide when regular group members shall be able to create and edit content, forum discussions, pages and collections in the group. Click in the field to see the calendar and select the start date. End date: You can allow the editing of group content for regular members up to a certain time. After that they will only be able to view forum discussions, pages, collections and files, but not edit them. Click in the field to see the calendar and select the end date. Group administrators can always edit content in a group. Group category: Choose a category if you want to associate your group with one, allowing you to filter groups on the My groups and Find groups page more easily. This setting is only available if the site administrator turned it on. You may not want to use this option in very large groups where lots of pages are shared but members do not have to be notified to prevent lots of notifcations going out. Der Seiteninhaber, der seine Seite mit der Gruppe teilt, erhält keine Benachrichtigung. Comment notifications: Select from the drop-down menu who shall be notified when feedback is placed on a page or artefacts. Click the Save group button to finish creating your group, or click Cancel to abort the group creation process. Im Vergleich zu normalen Nutzer/innen haben Mitarbeiter/innen und Administrator/innen der Institution weitere Rechte. Zusätzliche Optionen für Personal oder Admininstratoren von Institutionen. kontrolliert: Eine kontrollierte Gruppe ermöglicht den Mitgliedern nicht, sich auszutragen. Dies ist für Kursgruppen gedacht. Rollen: Entscheiden Sie, ob Sie nur Mitglieder und Administrator/innen oder auch Tutor/innen benötigen. Letztere können Feedback geben und Ansichten wieder freigeben wenn Einreichungen zulässig sind. Sie können jedoch keine Gruppeneinstellungen ändern. Allow submissions: Use this option to allow group members to submit pages or collections for feedback or assessment. These pages and collections as well as a number of content items in them are locked until released by a group administrator or tutor. Allow archiving of submissions: Use this option when you want to archive pages or collections that have been submitted to this group. The archive will be made on the server. Administrators can download the archived submissions and vital information about them. The archive is made at the point of the release of a portfolio. Hide group: Switch this option to „Yes“ if you do not want to list this group on the Find groups page. If users have the My groups block on their profile page, their group memberships are still listed there. The hiding of the membership and / or group only refers to the Find groups page. When you have site administrator rights, you have yet another setting when you create a group: Auto-add users. When you switch this setting to „Yes“, new users to the site are added to the group automatically. This is a great option when you want to set up a group which all users should join in order to participate in forum discussions. On mahara.org this is used to make every user a member of the „Community“ group in which discussions around Mahara take place. Von allen drei Orten kommen Sie zum gleichen Bildschirm wie beim Anlegen einer Gruppe und können hier alle vorgesehenen Änderungen vornehmen. You can change the group type to a different one. Please be careful if you do so especially when you have allowed submissions of pages and collections to the group. If users have submitted portfolio pages or collections to that group, they remain locked when you disable the setting Allow submissions. You must enable this setting again in order to release these pages or collections. Short name: You can view the group’s short name, which is needed to administer the group in bulk. Only site administrators can change the short name. Group short names can be from 2 to 255 characters in length and contain only alphanumeric characters, „.“, „-„, and „_“. Group homepage URL: If the site administrator activated clean URLs, your group (homepage) has a human-readable URL which you can change to a certain extend. Choose the name for your group (homepage) if you do not like the default one. It must be 3-30 characters long. You can only use lowercase letters from a-z, numbers and - (hyphen). 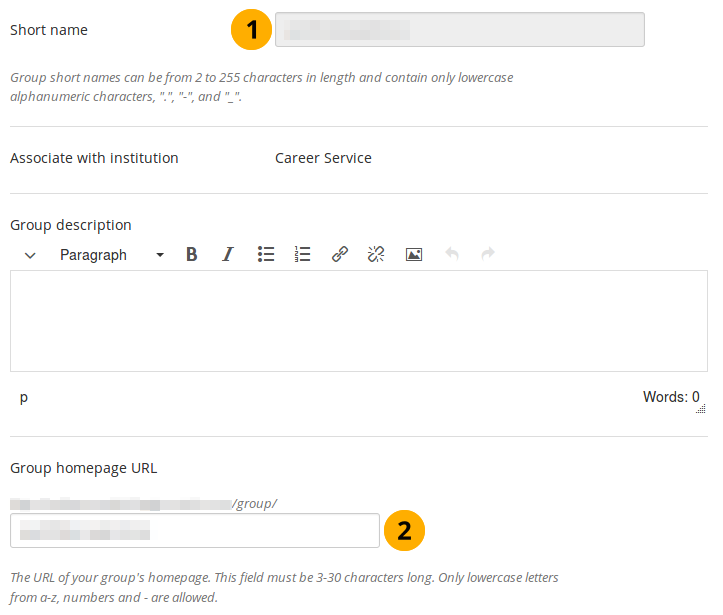 Your group will then be available via a URL like https://sitename/group/name-of-the-group, for example: https://mahara-university.org/group/portfolio-task-force. Die URL der Gruppenstartseite kann jederzeit von Ihnen geändert werden. Das kann Nutzer verwirren, die sich die Seitenbezeichnung gemerkt oder gebookmarkt haben. Es kann dann vorkommen, dass sie die Seite nicht mehr so leicht finden. The original, internal Mahara URL such as https://mahara-university.org/group/view.php?id=456 will still work. The Mahara manual is licensed under your choice of Creative Commons Attribution-ShareAlike 3.0 unported or GNU General Public License version 3 or later 2011-2019 Catalyst IT and others. Zuletzt aktualisiert am März 28, 2019. Created using Sphinx 1.8.1.